[149 Pages Report] The hardware security modules market was valued at USD 520.3 Million in 2016 and is expected to reach USD 1,101.2 Million by 2022, at a CAGR of 12.87% during the forecast period. The base year considered for the study is 2016, and the forecast for the market size is provided for the period between 2017 and 2022. The research methodology used to estimate and forecast the hardware security modules market includes the use of extensive primary research and secondary research. The secondary sources referred to for this study include directories; databases such as Hoovers, Bloomberg BusinessWeek, Factiva, and OneSource; and associations such as PCI security standard council. The vendor offerings have been taken into consideration to determine the market segmentation. The top-down procedure has been employed to arrive at the overall market size of the global hardware security modules market. After arriving at the overall market size, the total market has been split into several segments and subsegments, which have then been verified through primary research by conducting extensive interviews with key people such as CEOs, VPs, directors, and executives. This data triangulation and market breakdown procedures have been employed to complete the overall market engineering process and arrive at the exact statistics for all segments and subsegments. This report provides valuable insights into the hardware security modules market such as security solution providers, professional services related to the HSM, and end-user industry segments. 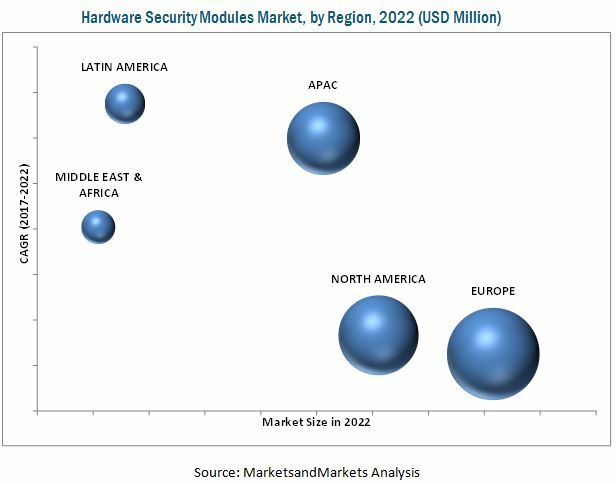 The hardware security modules market comprises HSM providers such as Gemalto NV (Amsterdam), Thales e-Security, Inc. (U.S.), Utimaco GmbH (Germany), International Business Machines Corporation (U.S.), FutureX (U.S.), Hewlett-Packard Enterprise Development LP (U.S.) SWIFT (Belgium), Atos SE (France), Ultra-Electronics (U.K.), and Yubico (U.S.). The global hardware security modules market, in this research report, has been segmented on the basis of type, application, industry, and geography. The hardware security modules market is expected to reach USD 1,101.2 Million by 2022, at a CAGR of 12.87% during the forecast period. The performance and characteristics of the hardware security modules depend largely upon the applications for which HSMs are deployed to provide the encryption key management for data and information security. The hardware security modules are used in several industries due to the security assurance and the benefits provided by HSMs to comply with the regulatory compliances for data security. The hardware security modules market has been segmented on the basis of type into LAN-based HSM/network-attached HSM, PCIe-based/embedded plugins HSM, and USB-based/portable HSM. The demand for USB-based/portable plugins HSMs is expected to grow in the future owing to the benefits such as lower cost compared to the LAN-based/network-attached HSMs and PCIe-based/embedded plugin HSMs, compact size, and portability features. The hardware security modules market has been segmented on the basis of deployment type into On-premise and cloud deployment. The demand for cloud deployment is expected to grow at the highest rate during the forecast period owing to the service provides by the cloud deployment to safeguard cryptographic keys with the same dynamic and virtualized attributes of cloud computing environments. The hardware security modules market, on the basis of application, has been segmented into payment processing, code and document signing, secure sockets layer (SSL) and transport layer security (TLS), authentication, database encryption, PKI or credential management, and application-level encryption. Authentication plays an important role in securing the data and information by proving the secure key exclusively to the authorized person for making any transaction, logging in, or performing any administrative process. Therefore, the deployment of HSMs for the authentication application is increasing rapidly and is expected to grow at a faster rate during the forecast period. The hardware security modules market, on the basis of industry, has been segmented into banking and financial services, government, technology and communications, industrial and manufacturing, energy and utility, retail and consumer products, and healthcare and life sciences, among others. The market for other industries, which include media and entertainment, education, and transportation industries, is expected to grow at a high rate, followed by the retail and consumer products industry. Latin America is expected to be the fastest-growing market for the hardware security modules, followed by APAC during the forecast period. The market in Latin America is expected to grow at the highest rate during the forecast period owing to the formulation of new regulatory compliances and the adoption of modern technologies such as cloud and IoT, which create a huge opportunity for data and information security. Key players in this market focus on new product developments, strategic partnerships, acquisitions, and agreements to increase their revenue. For instance, in February 2017 Utimaco launch its new product which gives cloud applications a much-needed security boost with the latest version of its SecurityServer line of hardware security modules (HSMs). The Utimaco SecurityServer 4.10 is a new generation of HSM optimized for cloud applications providing unrivaled flexibility and security for HSM-as-a-Service usage in the cloud.